Takara Super Ideal lab diamonds blog - "The road to 3cts...."! Would the blog be better as a video/audio? 2 - The Amora blog had 5 million views...why change? 3 - try it and see, not sure yet. Happy Friday and welcome back! 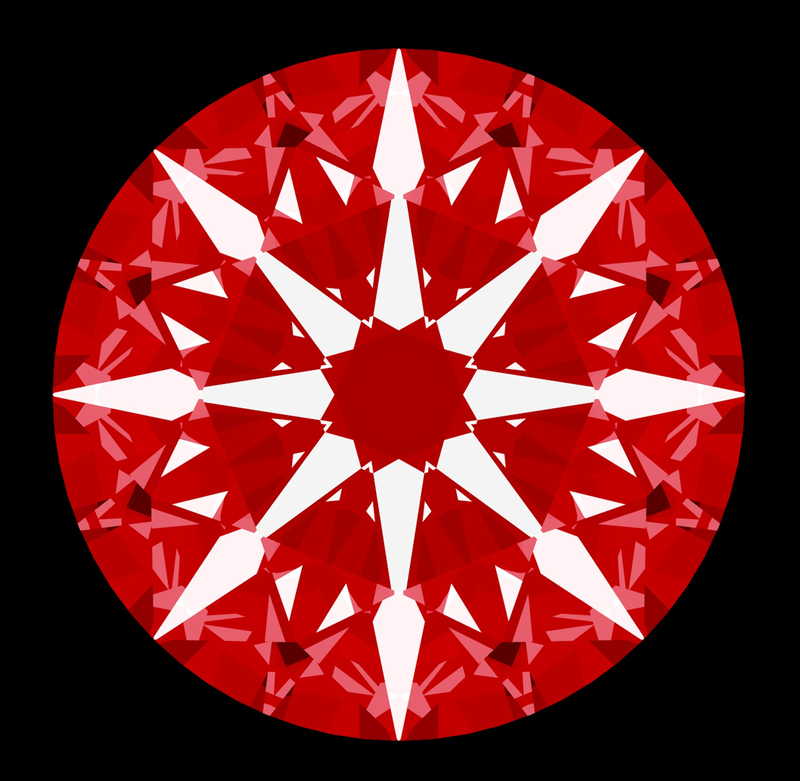 I haven't done our monthly blog in over a year now (vs 5+ years continuously before that)...but we've got some exciting things happening with our Takara lab diamonds that are going to be similar to the Amora R&D journey all over again (but faster). Thus, I thought it might be fun to start a new monthly blog covering our Takara lab diamond journey from now until we hit 3cts! Thus, the new "Takara blog - the road to 3cts...". We'll of course keep up with Amora, our new Phoenix Moissanite, etc. but the main purpose of the blog will be the Takara journey. That said, please grab a drink, get comfortable and let's get underway with catching up and offering some details on the latest news here with BTD! Takara updates: Let's kick things off with a bang. We have been working steadily on our Takara lab diamonds since literally last September...and things started off pretty small (i.e. .40ct, .50ct) but by December we started getting .70ct...and as of two weeks ago, multiple 1ct+ Takara's (and now 1.20ct+ in cutting!). Before I get into details though, let's start with a studio video and photo of one of our Super Ideal Takara's so you can see for yourself what they are about! 1 - Cut to Super Ideal Hearts and Arrows, AGS-000 equivalent! Effectively, these are cut better than 99% of all diamonds (lab or mined) and the beauty these have completely speaks for itself. I have yet to show someone a Takara and not have them gasp at first sight on seeing how utterly brilliant these are. We'll have a review coming in shortly from a diamond expert, but I can summarize their reaction with one of their own words used to describe it - "Stupendous" lol. 2 - Price point - We have had Takara's before in limited quantity but not cut to the level we are doing now. But besides the stupendous beauty, the other big improvement is the price point. We are coming in below any other lab diamond pricing (even with our AGS-000 Super Ideal cutting) and at 1/3 -1/4 the pricing of the equivalent mined diamond. For 1ct+, that maps to roughly $2500/ct and down to $1400/ct for < 1ct, all the way to $670/ct for 3mm H&A Takaras! (and finally for <3mm, ala 1.5mm,etc. 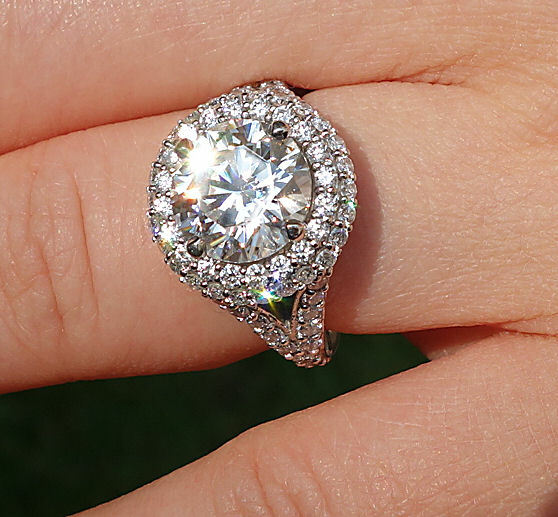 we are at $270/ct though not H&A cut of course). The 1.07ct F colorTakara Super Ideal that recently sold for $2568. Equivalent mined diamond = $8432. 3 - Incredible brilliance - to some degree, I'm not sure where this extreme brilliance comes from, but it's part of the reason it draws so many gasps. Our Takara's are grown via HPHT, and not CVD like most lab diamonds, which is why the color is D-G, vs most CVD diamonds end up at H - K.
(we'll go into why this is in detail in the future in this blog. We grew with CVD from 2005 - 2011 for reference). But we've also compared them with similar mined H&A Super Ideal diamonds. The one possible reason I can think of is that our Super Ideal cutting for Takara is really more like how Eightstar used to cut...specifically if you look at the arrows on the Takara's, there is no bow tie vs. the mined H&A we compared with does have bow ties. In theory, the bow tie pattern means slightly less light return (that's why it's white in the scope vs red) so that's the working theory for now. Often times the greatest beauty is found within the simplicity of a common task executed to perfection; in this case, the cutting of a diamond. Recently I had the pleasure of examining my very first Takara Eternity, and it is without a doubt one of the most exquisite diamonds in existence. 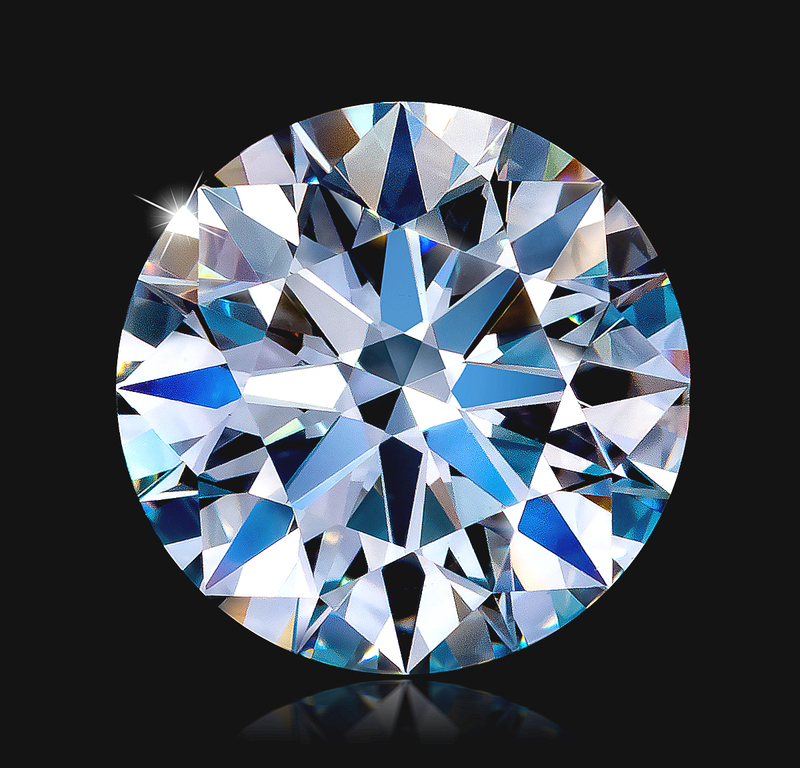 If cut is the first consideration when ordering your priorities of the four C's, Better Than Diamond has knocked it out of the park with their achievement. No facet of performance has been overlooked or sacrificed, with easily discernible hearts and arrows and sparkle that just lends itself to being admired for long stretches of time while you are temporarily mesmerized by the allure of a diamond that is everything a diamond should be. Everyone who saw it was completely awed, including a long time jeweler. For those who find it helpful, it has an HCA score of 0.9. Indeed, the only "fault" to be found (at least for me, which is entirely personal preference) is I will need them a little bigger! Lot's more 1ct+ coming next month, and even up to 1.50ct in size! The other big news is that there has been even more progress on sizes for the Takara. This week we started cutting two of our largest ever - based on the initial Sarine HD estimate, one will be a 1.20ct, and the other...possibly a 1.50ct! That's pretty phenomenal considering how much rough you have to cut away to produce a true Super Ideal H&A, AGS-000 equivalent! Production is thus ramping up and we are hoping to get to as many as 100/month by late Summer. Thus, we hopefully won't repeat the stressful years of Amora production where we had so many issues with supply. Ironically, the production process with Takara in terms of cutting is much, much simpler by comparison with the toughness of the Amora. Amora Updates! Never fear, while the blog is focused on Takara b/c that's where all the new R&D is, Amora continues to perform and impress! In fact, Takara will end up filling in nicely into a new gap we are having with the Amora Eternity production, which is that we are out of rough for the 6mm size and down to just a few pieces left for 1ct size. It's unfortunately just very difficult to hit that size during growth - the start of each run is costly due to the seed expense, and you can't monitor the growth height directly due to the extreme heat...thus we don't want to 'undergrow' and end up with .25ct that we'd lose money on, so usually the result is we end up with 2ct range thickness and can't afford to cut down a 2ct just to make 1cts! Amora vs H&A diamond - we actually made a video comparing Amora to H&A diamond last spring and amazingly, it never made it into a blog given the 1 year hiatus...so here's Amora next to a $45K H&A diamond. Now, as noted, the Takara's are slightly brighter so the comparison of Takara vs Amora is not quite the same, but this is a very expensive mined diamond compared with Amora Eternity. The result is they are virtual clones and you could readily make a pair of earrings from them! and finally, something we haven't shown before but here's the very expensive laser system used to prep the Amora rough for processing! Earring Explosion - one interesting trend that has happened since last Fall is our stud earring sales have rocketed up to now become our 2nd best selling category (loose Amora is still first place), but the earrings have outpaced our ring sales. 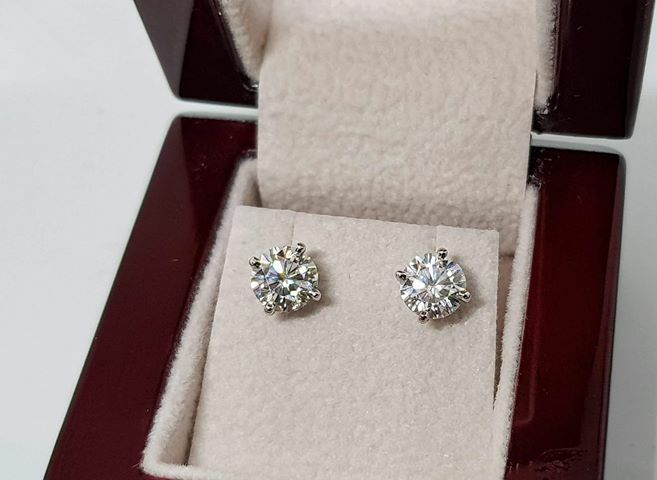 That's not just Amora studs, but also Avarra lab grown emerald studs and our very improved Phoenix H&A moissanite studs. As a result, we are currently sold out of most prestocked sizes but are restocking a number of these now. Part of the growth may be b/c we are offering many of them as "Overnight earrings" - meaning, they are set and ready to go and if you order before 1PM PST Mon-Thursday, we get them to you next the next day! That's a big improvement from the normal 2-3 week time between ordering and receiving as before. Phoenix H&A Moissanite: Our Phoenix H&A moissanite cutting has improved further and now these are routinely beating out every other Moissanite we've seen, and at a fraction of the price - $220/ct! Last year in customer testing, we did in person comparison's with Amora Eternity, F1 H&A Moissanite and Phoenix H&A. The results were always unanimous - everyone immediately picks out the Amora as the most beautiful and then would end up stumped between the F1 and the Phoenix. The usual summary was "they look the same". Now, with the improved precision, I don't believe that will be the case in that Phoenix has improved a lot in terms of it's H&A symmetry and as such, these really offer an incredible bang for the buck in terms of beauty/value and thus why we're seeing strong demand for the Phoenix H&A studs ( 1ct each ear with 4 prong martini settings and protector backs, $549!). DiamondBistro.com - record website traffic, record listings and record transactions! One big change this year (2019) has been the rapid growth of DiamondBistro - it's hit records for traffic each month, with overall traffic up 25% in the past three months. Similarly, ring listings hit a new record of 2300+ online as I type. And of interest, we're seeing a lot of higher and higher value items ($8K, 15K+, etc) being listed and sold on the bistro, so it's really evolved from the early days as an offshoot of the message boards Buy/SellTrade forum. In order to help further that growth, we've partnered with Escrow.com and so hopefully in about two weeks, you'll be able to transact on DiamondBistro using Escrow.com's service (if you choose, totally optional) but that will let people transact with a greater level of trust with sellers esp for the higher value items. We also still need to do some improvements to site speed, and some other items but for now, it's really nice that small amount of ad revenue is now finally covering the daily hosting fees - DB has been a money loser for a long time, so it's nice to see it starting to blossom and take off and hopefully can turn into a major platform for buying/selling over the next year plus. Note - your feedback on what we need to do to improve DiamondBistro.com is very welcome - just post on the boards or on our Facebook page. And speaking of that, we may shortly make a separate page for DiamondBistro.com on Facebook as a way for people to see new listings or discuss items there. Please take a look and see the increased listings available! Misc: Of interest, lab grown diamonds are starting to rocket past mined diamonds in terms of annual sales growth, with the market expected to grow at +22% per year vs 2% mined diamonds! Next month - more details on Takara Super Ideals including new logo and more videos and growth details (HPHT vs CVD growth and why HPHT produces superior results). Also, I've been mulling over moving the blog into a video/audio blog instead of plain text. I'd need to get a pro microphone for it (b/c the sound is awful talking into my recording...computer fan sounds like I'm broadcasting in a hurricane even though it's minimal in reality). But, if you think that would be a funner/more exciting format, please let me know in the comments! We've got Amora restocks, Avarra emerald restocks, Phoenix restocks and of course, Takara restocks all in progress now so we'll go into more details about all those next month as well. (oh and new matching band for our famous Eclipse ring!). For now have a great weekend and upcoming month, thanks for stopping by and look forward to talking with you next month!